The official motion picture soundtrack to A Star Is Born - which features music from six-time Grammy Award-winner Lady Gaga and director Bradley Cooper. 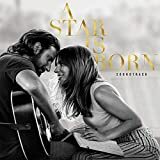 Featuring 19 songs in a wide range of musical styles, and 15 dialogue tracks featuring those moments that will take listeners on a journey that mirrors the experience of seeing the film, the soundtrack to A Star Is Born follows the musical arc and romantic journey of the movie's two lead characters: Bradley Cooper's Jackson Maine, and Lady Gaga's Ally. CD released in 2018 via Polydor.